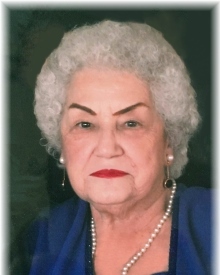 Pauline M. (Correnti) Sanguedolce, 87, of Methuen passed away peacefully at home on Friday, September 7, 2018 after a long illness surrounded by her family. Born May 8, 1931 in Braintree, MA, she was the daughter of the late Mary (Loiacono) and Vincent Correnti. She was a graduate of Braintree High School. Pauline was a bookkeeper for MacDonald & Pangione Insurance Company for many years until she left to join her husband in their family owned business, Dolce’s Restaurant & Catering in Lawrence. She enjoyed gardening, cooking, music, and most of all her family, especially her grandchildren and great-grandchildren. She was everyone’s Nana on the field and in the ice rink, never missing a game. Sadly, in addition to her parents, Pauline was predeceased by her son, James Sanguedolce. She is survived by her husband of sixty-six wonderful years, Santo P. Sanguedolce of Methuen; son, Dr. Phillip Sanguedolce and his wife, Janet of Meredith, NH; daughters, Sandra Sanguedolce Desrosiers and her husband, Leonard, Paula Sanguedolce Hartt and her husband, Michael, all of Methuen; grandchildren, Jesse Sanguedolce and his wife, Eveleth Greene, Micah Sanguedolce and his wife, Manisha Khadka, Lisa Desrosiers, Rich Smith, Jaime Tine and her husband, Frank, Nicholas Hartt and his companion, Mariana Garza, Brandon Hartt and his fiancée, Katie Achilles; great-grandchildren, Savannah, Bella, Viviana, Talia, Amaya, Maisy and Marston; sister, Grace Eno and her companion, Herbert Merrick , Josephine DiTullio and her husband, John, Virginia Murphy and her husband, Jack, and Joseph Correnti and his wife, Judy. She also leaves behind many loving nieces and nephews. Family and friends are respectfully invited to calling hours on Wednesday, September 12, 2018 from 4-8 PM at Cataudella Funeral Home, 126 Pleasant Valley Street in Methuen. A funeral mass will be held Thursday, September 13th at 11:00 AM at Our Lady of Good Counsel / St. Theresa Church, 22 Plymouth Street in Methuen. Burial will follow at St. Mary’s Immaculate Conception Cemetery in Lawrence. In lieu of flowers, donations may be made in Pauline’s memory to the Alzheimer’s Association, 480 Pleasant Street, Watertown, MA 02472.